As per usual, my fabulously fanatical football friend, Hollie (check out her blog at afandivided.com), is throwing a Spectacular Superbowl Sunday Soiree (I'm feeling alliterative today). Her menu? Chili, cornbread, wings, veggies, and a Snack Stadium extraordinaire that I'm going to help construct and fill. As any good guest would, I've offered help in providing the gridiron grub. Scott and I will be pouring our signature drinks (see my Pigskin Particulars entry below! ), bringing a side and a dessert. For the drinks, I decided to alter The 49er and go a little lighter with a simple Campari and Sprite mixture. It goes down a little smoother, and won't knock you on your tail before halftime. 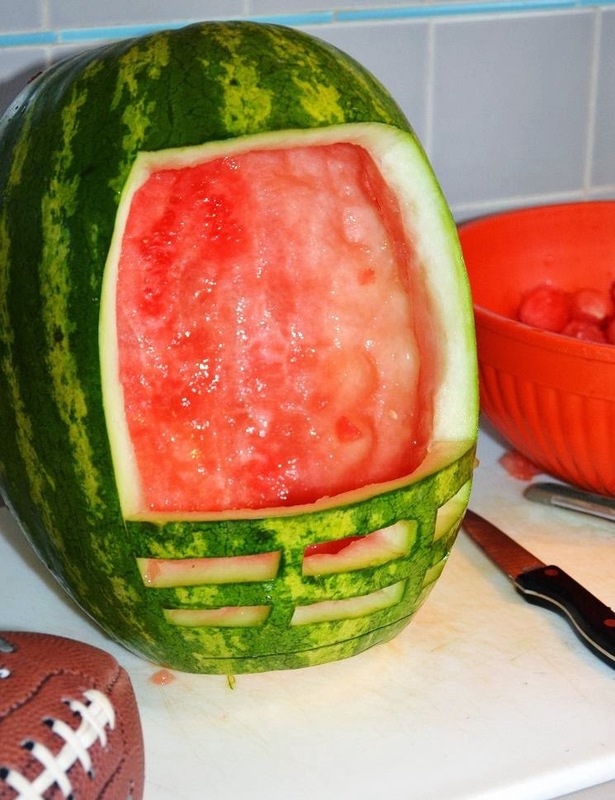 As I always need to be cautious of my OWN zone coverage, I'm bringing some midline-friendly cut fruit to pick at throughout the game. I replicated the football helmet fruit basket I found online and am quite pleased with the results. Once I get to the party, I'll fill the watermelon with melon balls, blueberries, strawberries and grapes. I also whipped up some Laces Out Marshmallow Treats and decorated with team appropriate colored sugar. I chose to display them on a playbook-style cheese slate, complete with Xs, Os and team names. Now it's off to Hollie's for the Snack Stadium Spectacular. Game on!